The story of the Rohilla never ceases to amaze me and following the release of my book I have gotten letters from time to time which my publisher has forwarded. I also get e – mails sometimes with a general enquiry but sometimes with something specific leading to a new development often from people related in one way or another to the loss of the hospital ship. 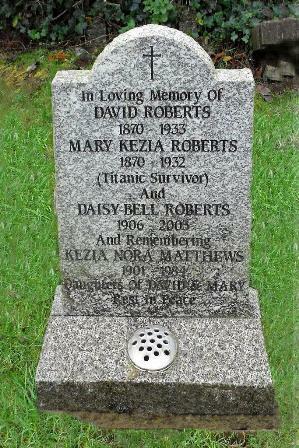 Usually when the loss of the Rohilla is discussed either personally or in publications there is often a mention of Mary Kezia Roberts, a stewardess that also survived the loss of the ill fated RMS Titanic just two years earlier. When I received an e-mail from Mrs. Mandy Harvey a great great granddaughter of Mary Roberts I was over the moon. I have been exchanging information with Mandy and her family and have learnt far more about Mary than I had known when writing my book. I have also been most fortunate in locating a photograph of Mary Roberts along with other stewardesses that survived the Titanic's loss. Given this very unique story I felt that it would be nice to explain a little more about Mary Roberts, her 'sea career' and her unfortunate experiences with two of Harland & Wolff's liners. 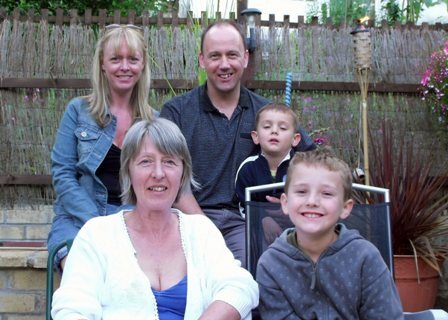 Mandy pictured at the front with her son Paul and daughter Tara behind. Mary Kezia Humphreys was born in Liverpool on Wednesday 19th October 1870. Aged 26 she married David Roberts on the 2nd December 1896, strangely her marriage certificate has her age listed as 24 and bearing a middle name of “Dooley?” Their only son Francis was born two years later on the 9th April and followed his father’s footsteps as an electrical engineer. They also had three daughters, Keziah Norah (1901), Daisy Bell (1906), and Kathleen with research yet to identify when she was born. Aged 42, Mary Roberts signed onto the RMS Titanic at Southampton on the 6th April 1912 listing her address as 9 Chestnut Grove, Nottingham. Before joining the Titanic as a member of the “victualling” crew her previous ship had been the Adriatic. The Adriatic was the last of White Star's turn of the century "Big Four", and the only one of the four which was never ‘the world's largest ship’. This ship, the second to bear the same name, was built by Harland and Wolff, Belfast, and launched in 1906 (coincidentally the same year as the Rohilla). Adriatic made her maiden voyage from Liverpool to New York on 8 May 1907, but her return was to Southampton, as White Star moved its principal terminal there. Adriatic made White Star's first Southampton departure on the 5th June. During the loss of the Titanic Mary was placed into lifeboat 11 and later picked up by the Carpathia before finally disembarking at the Titanic's intended destination of New York on Thursday 18th April 1912. 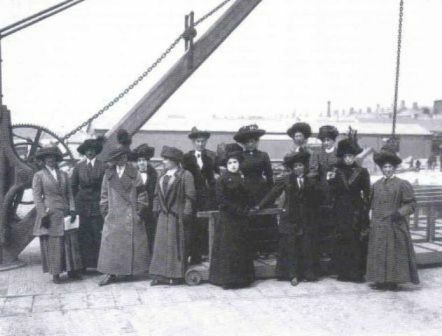 Although not easy I have been fortunate enough to find a photograph of stewardesses that had survived the loss of the Titanic which includes Mrs. Roberts. 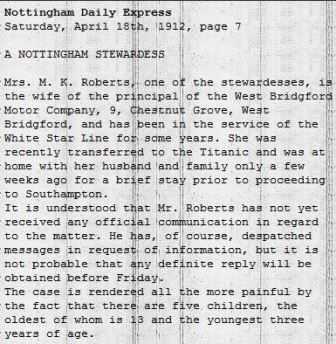 Mr. Roberts of 9 Chestnut Grove, West Bridgford, whose wife was a stewardess on the Titanic, has received a cablegram announcing that she is safe. NOTE: Research indicates only four children, also at the time of the Titanic’s loss Francis as the eldest child was 14, Norah 11 and Daisy 6 years of age, therefore if the newspaper is correct the three year could possibly be Kathleen? Despite surviving the Titanic Mary Roberts continued her career as a stewardess, leaving Southampton just six weeks later engaged on the RMS Majestic for the remainder of 1912. Extracts from the Registrar General Agreements (Certificate of Discharge) show the Majestic as departing from Southampton on the 22nd May, 12th June, 24th July, 14th August and the 4th September. In 1914 Mary boarded the ill fated Rohilla miraculously surviving that tragedy too being brought ashore by the Whitby No 2 lifeboat "John Fielden" on its first run to the wrecked vessel. The survivor of two great sea disasters, Keziah declared that of the two catastrophes the sinking of the Rohilla was the worse to endure. It is likely that in surviving the loss of the Titanic Mrs. Roberts was put aboard the ships lifeboat in what may have been cold but fairly settled sea conditions. In complete contrast to the circumstances surrounding the Rohilla where the survivors had to endure horrendous gale conditions and the ship slowly breaking apart. One would have thought that having survived two major maritime losses that she might have chosen another career. Mary Roberts served her last commission on another of Harland & Wolff’s vessels, the SS Rajputan, official number 146361. Embarking in London on the 14th February 1929 the Rajputan was bound for Bombay where Mary Roberts was discharged on the 8th March the same year. I have a copy of a small letter from Norah Keziah Matthews (nee Roberts) in which she contacted the BBC about the telegrams she had confirming her mother’s survival after the loss of the Titanic and the Rohilla. The letter was typewritten when Norah was 64 and mentions how she was 11 years of age when her mother embarked on the Titanic, there is a brief mention of a book her mother wrote and another avenue of research for me to follow. 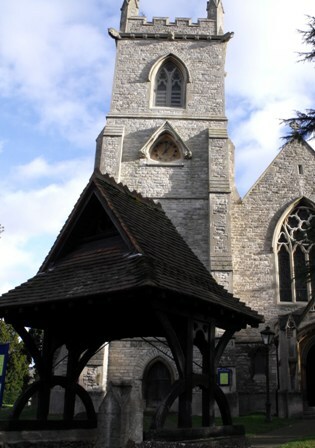 Mary Roberts passed away aged 62 on the 2nd January in 1932, a year before her husband David Roberts who died in a motor cycle accident, they are buried together in the church of St Mary the Virgin Church, London Road, Ewell, Epsom, Surrey. They left behind four children Frank (Francis), Keziah Norah, Daisy Bell and Kathleen. 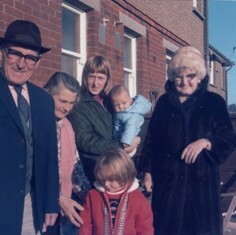 Daisy Bell Roberts 1906 – 2003. Keziah Norah Matthews (Roberts) 1901 – 1984. I have added a pdf which presents Mary Roberts signing onto the Titanic.